Did you know one of the biggest breakthroughs in the “science of coaching volleyball” today is called “Reading the Game”? Most of the ideas related to this were first introduced by Karch Kiraly (considered the greatest volleyball player in the sport) on his retirement and transition into coaching just a few years ago during a presentation at an AVCA Convention in San Antonio, Texas. 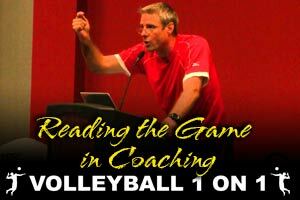 Click Here to See Karch Kiraly Presentation on Reading the Game! Karch explained that in review of his own ability as a volleyball player, one of his greatest strength was his ability to “Read the Game”. Karch believes when coaching players today that helping them understand and implement how to “Read the Game” is one of the most important player skill for success in volleyball. Technically, “Reading the Game” is seeing outside stimuli and responding to what you see with a volleyball specific skill. Reading – Seeing outside stimuli. Planning – Mentally responding to the stimuli and planning your action and /or how the skill is performed. Doing – Where the volleyball skill is performed. The result is: READING – PLANNING – DOING Model for “Reading the Game”. Here is perhaps the best video I have seen on the topic! Through my own observations as a player and coach I realized this system can be vastly improved, specifically how we as coaches teach players the process of how we as humans respond to stimuli (predominantly with our eyes), which is the basis of how all volleyball skills are performed. I will be sharing more with you on these Modern Volleyball Coaching techniques in the weeks to come here on Volleyball1on1.com. Included will be some of the ground breaking work I have been collaborating with Dr. Bill Harrison on to further develop and improve “Reading the Game” Concepts. Dr. Bill Harrison is a vision expert who has worked with some of the biggest sports legends in history such as Hall of Fame PGA Tour golfer Jim Colbert and Hall of Fame Baseball Player George Brett and Greg Maddux. I too will be teaching in-person these new “Reading the Game” Concepts at our TRAVEL TO YOU Volleyball1on1 Summer camps. If you are interested in finding out more about my Volleyball1on1 Summer Camps, click the link. Finally if you have thoughts or comments on this topic please let me know below in the comment section.